The Science Council’s CPD Awards are back following its success last year. The CPD Awards are designed to celebrate the professional development efforts and achievements of registrants across Registered Science Technician (RSciTech), Registered Scientist (RSci), Chartered Scientist (CSci) and Chartered Science Teacher (CSciTeach) status. For the first time this year nominations are open for individual submissions, which means that individuals can either self nominate of nominate someone they know, and employers can nominate members of their team for the awards. If you think you’ve got an excellent CPD record or if you work with someone who goes above and beyond to ensure they are keeping on top of their CPD activities make a nomination today! Find out more about the CPD Awards. Nominations close on Friday 21 July 2017 at 12pm. Winners will be awarded with a certificate and a prize at an awards event in September. 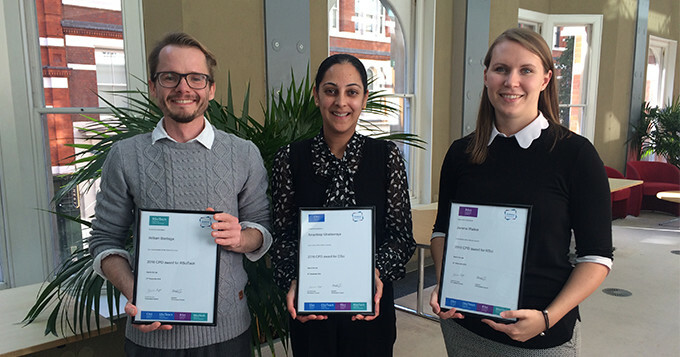 Photo (L-R): William Bardega (RSciTech CPD Awards 2016 Commendation), Amardeep Ghattaoraya (CSci CPD Awards 2016 Winner) and Jemma Walker (RSci CPD Awards 2016 Winner).